Last week, a wide variety of U.S. media (including the Wall Street Journal and USA Today) marked what they considered to be the ten-year anniversary of the beginning of the global economic crisis—from which we still haven’t recovered. The event in question, which occurred on 9 August 2007, was the announcement by international banking group BNP Paribas that, because their fund managers could not calculate a reliable net asset value of three mutual funds, they were suspending redemptions. But, as I explain to my students, “Beware the appearance of precision!” For example, the more numbers after the decimal point (2.9, 2.93, 2.926, etc. ), the more real and precise the number appears to be. But such a number is only ever an estimate, a best guess, about what is going on (whether it be the growth of output or the increase in new home sales). The same holds for dates. It would be odd to choose a particular day ten years ago that, among all the possible causes and precipitating events, put the U.S. and world economies on the road to the Second Great Depression. That would be like saying World War I was caused on 28 June 1914, when Yugoslav nationalist Gavrilo Princip assassinated Archduke Franz Ferdinand of Austria. Or that the first Great Depression began on Black Thursday, 24 October 1929. Given the centrality of housing sales, mortgages, and mortgage-backed securities in creating the fragility of the financial sector, we could just as easily choose July 2005 (when, as in the green line in the chart above, new one-family house sales peaked), January 2006 (when, as in the blue line, new privately owned housing units starts peaked), or February 2007 (when the Case-Shiller home price index, the red line, started its slide). Or, alternatively, we could choose the third quarter of 2006, when the U.S. corporate profit share (before taxes and without adjustments) reached its peak, at almost 12 percent of national income. After that, it began to fall, and the decisions of capitalists dragged the entire economy to the brink of disaster. Or the year 2005, when the profits of the financial and insurance sector were at their highest level—at $158.3 trillion—and then began to decline. Then, of course, it was bailed out after falling into negative territory in 2008. 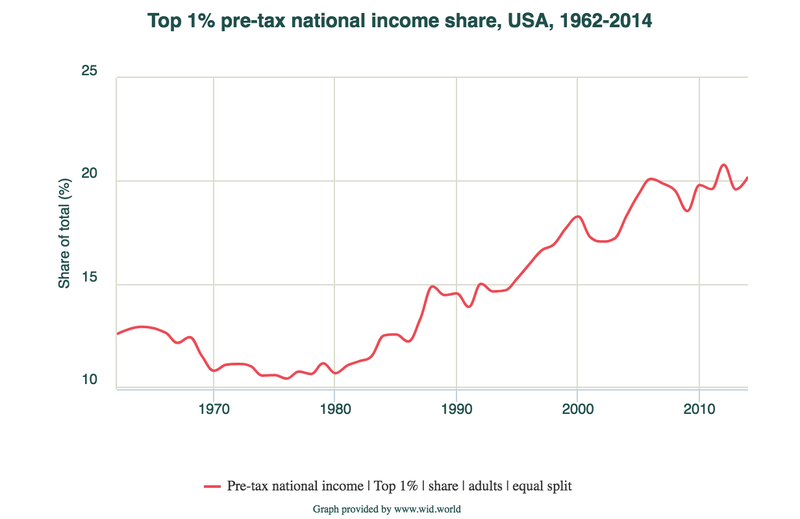 Or, given the centrality of inequality in creating the conditions for the crash, we can go all the way back to 1980, when the share of income going to the top 1 percent was “only” 10.7 percent—since after that it started to rise, reaching an astounding 20.6 percent in 2006. Those are all possible dates, some of course more precise than others. What is important is each one of those indicators gives us a sense of how the normal workings of capitalism—in housing, finance and insurance, corporate profits, and the distribution of income—created, together and over time, the conditions for the most severe set of crises since the first Great Depression. And now, as a result of the crash and the nature of the recovery, all of them have been restored. Thus creating the conditions for the next crash to occur, ten years after the last one.